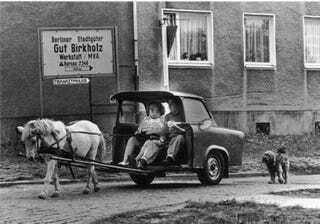 While it may seem hard to believe, the two-stroke paper mache cotton by-product and resin bodied Trabant had a more than thirty year production run in the former Soviet East Germany. A whopping 25 glorious worker's horsepower brought the agitprop runabout to 60 miles per hour in 21 seconds! Top speed of 70 mph was reached at an undetermined point sometime after that. These highly sought after features put workers who wanted to revel in Trabant motoring on an eighteen-year waiting list to get behind the wheel. 85,000 or so of the 3.7 million Trabants to roll off the assembly line are still on the German road, and celebrating a happy 50th birthday with a cake frosted in Duroplast today.